You will earn 1,560 Reward Points. Earn 1 reward point for every 1 dollar spent. 3⁄4" rear gas connection and pressure regulator. One 27,000 BTU/hr. “U” shaped aluminized steel burner for every 12” of griddle width. 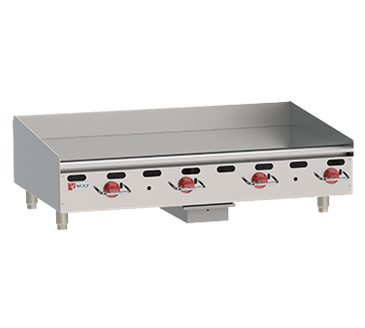 Spatula wide 31⁄2" grease gutter and grease chute is fully welded for easier cleaning and to stop grease migration. Full or partially grooved griddle plate.